Welcome to the A-1 Limo Rewards Club! PLEASE READ THESE TERMS AND CONDITIONS CAREFULLY. BY ACCESSING OR PARTICIPATING IN THE A-1 LIMO REWARDS PROGRAM, YOU AGREE TO BE BOUND BY THESE TERMS AND CONDITIONS AND ALL TERMS INCORPORATED BY REFERENCE AS DESCRIBED BELOW. IF YOU DO NOT AGREE TO THESE TERMS AND CONDITIONS, YOU MAY NOT ACCESS OR PARTICIPATE IN THE A-1 LIMO REWARDS PROGRAM. These A-1 Limo Rewards Program Terms and Conditions (“Rewards Terms”) apply to your access to and participation in the A-1 Limo Rewards Program (“RewardsProgram” or “A-1 Limo Rewards”), which is operated by A-1 Limousine, Inc. or its affiliates (collectively, “A-1 Limousine”, “our”, “us” or “we”). These Rewards Terms do not alter in any way the terms or conditions of any other agreement you may have with A-1 Limousine for other products and services. Please note that your access to and participation in the Rewards Program is also governed by the terms, conditions, limitations and requirements linked in these Rewards Terms, all of which (as may be changed over time) are incorporated into these Rewards Terms. A-1 Limousine reserves the right to change, modify and/or eliminate the Rewards Program and/or all or any portion of these Rewards Terms or any policy pertaining to the Rewards Program at any time and in our sole discretion, including our right to discontinue or change the Tiers (defined below) or benefits or change the expiration date of Rewards Points (defined below) or Rewards Codes (defined below) received under the Rewards Program, merge the Rewards Program with another rewards program, or to adjust how Rewards Points are earned, calculated or redeemed. It is possible that you may be unable to receive enough Rewards Points to redeem a Rewards Code if we discontinue the Rewards Program or merge the Rewards Program into another rewards program. If we make changes, we will post the amended Rewards Terms. Unless we say otherwise, the amended Rewards Terms will be effective immediately and your continued participation in the Rewards Program after the amended terms are posted will confirm your acceptance of the changes. If you do not agree to the amended Rewards Terms, you must stop participating in the Rewards Program. You must be a United States resident (including residents of U.S. Territories) who is at least 18 years of age to participate in the Rewards Program. The Rewards Program is intended for personal use only, and commercial use by commercial customers. Current A-1 Limousine employees and contractors, and their immediate family members living in the same household, are not eligible to participate in the Rewards Program. The Rewards Program is a free customer loyalty program that allows participants to earn “Rewards Points” with qualifying purchases on A1limo.com. Participants may also earn Rewards Points by participating in Promotional Activities (defined in Section 5) that may be offered through the Rewards Program from time to time. Participants in the Rewards Program may redeem accumulated Rewards Points BEFORE the start of any qualifying trip or for “Rewards Codes” that can be used toward purchasing items on A-1 Limousine.com and may also use the Rewards Points for other purposes as may be provided by A-1 Limousine from time to time. These Rewards Terms provide a general overview of the Rewards Program. For more information about earning, calculating or redeeming Rewards Points, Tiers, Promotional Activities and other details, please visit our Rewards Program page. Email A-1 Limousine at rewards@a1limo.com. Certain select customers will be automatically enrolled in the Rewards Program. If you are automatically enrolled, you still must agree to these Rewards Terms in order to complete your enrollment and participate in the Rewards Program, including redeeming Rewards Points for Rewards Codes or receiving any other Rewards Program benefits. 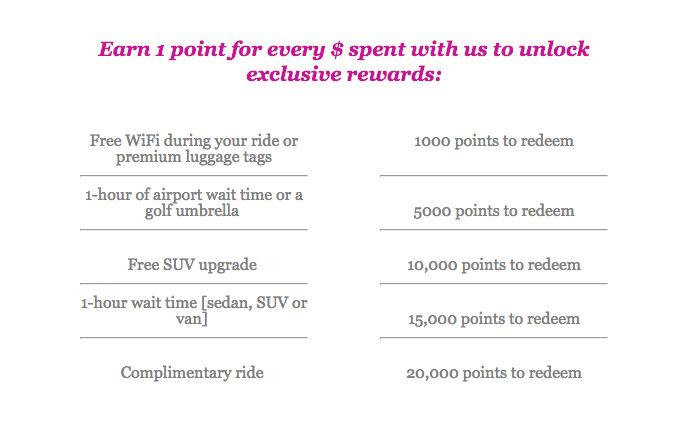 If you do not agree to these Rewards Terms, you cannot participate in the Rewards Program. Auto-enrolled customers may opt-out of the Rewards Program at any time by contacting the A-1 Limousine Customer Rewards Team via email or by calling 1-800.367.0070. Once you are enrolled in the Rewards Program and have accepted the Rewards Terms, you can manage your Rewards Program account (“Rewards Program Account”) by contacting one of our wonderful Customer Rewards Team members at 1-800-367-0070. You may only have one Rewards Program Account, and it is nontransferable. You are responsible for anyone else who uses your Rewards Program Account. The benefits that are available to you through the Rewards Program are based on Tier level and on the number of Rewards Points that you earn by making qualifying purchases on A1limo.com or otherwise participating in A-1 Limo Rewards Program Promotional Activities. Purchases. In order to receive Rewards Points for a purchase, your order must be placed in the A-1 Limousine Account that is associated with your Rewards Program Account. You will earn Rewards Points based on the base fare, excluding any tax, tolls, parking, other associated fees and gratuities as well as any purchases made with Rewards Codes, other discount codes or gift cards. Promotional Activities and Events. From time to time, we, or others acting with our permission, may offer you opportunities to earn bonus Rewards Points, such as inviting you to engage with A-1 Limousine in special promotional events or activities in exchange for Rewards Points (“Promotional Activities). The Rewards Program offers different benefits based on different Rewards Point levels (“Tiers). Your Tier status is determined by the number of Rewards Points that you accumulate in your Rewards Program Account. You Rewards Points posted to your Rewards Program Account can be applied toward future A1limo.com purchases. You can redeem your Rewards Points by calling the A-1 Limousine Customer Rewards Team at 1-800-367-0070. Rewards Points accumulated under the Rewards Program are promotional in nature and have no cash value. Your Rewards Points and your Rewards Program Account are personal to you and may not be sold, transferred (by operation of law or otherwise) or assigned to or shared with, family, friends or others. You are responsible for any federal, state or local taxes applicable to your participation in the Rewards Program. Points. POINTS EXPIRE IF THERE IS NO ACTIVITY ON YOUR ACCOUNT FOR ONE (1) YEAR. SHOULD YOUR ACCOUNT REMAIN INACTIVE FOR A PERIOD OF A YEAR (OR LONGER) YOU MAY BE ABLE TO REACTIVATE YOUR POINTS FOR A FEE TO BE DETERMINED AT THE TIME OF ACCOUNT RE-ACTIVATION. If you cancel any services that you reserved with your Rewards Points in accordance with the A1limo.com Cancellation Policy, you will be refunded the amount you paid (excluding the value of the Rewards Points and any other discounts) to the original method of payment. For example, if you placed an order totaling $100 for one item and used a $10 in Rewards Points, we will refund $90 to your original method of payment. You will not receive replacement Rewards Points for cancelled services and A-1 Limousine will not credit the redeemed Rewards Points back to your Rewards Program Account. Without notice to you, A-1 Limousine reserves the right to suspend or terminate your Rewards Program Account and/or your participation in the Rewards Program (in whole or in part), if A-1 Limousine determines in its sole discretion that you have violated these Rewards Terms, you have more than one Rewards Program Account, or that the use of your Rewards Program Account or your participation in the Rewards Program is unauthorized, abusive, deceptive, fraudulent or otherwise unlawful. A-1 Limousine may, in its sole discretion, suspend, cancel or combine Rewards Program Accounts that appear to be duplicative. In the event that your participation in the Rewards Program is terminated, you will not be able to redeem any accumulated Rewards Points. Without notice to you, A-1 Limousine also reserves the right to “unregister” a Rewards Program Account that is inactive and cause that Rewards Program Account to be ineligible for the Rewards Program. An inactive Rewards Program Account is defined as a Rewards Program Account that has not earned Rewards Points for one year. In the event that your Rewards Program Account is unregistered due to inactivity, then you will no longer be eligible for Rewards Program benefits, including accumulating Rewards Points or converting your Rewards Points into Rewards Codes. You may reactivate your Rewards Program Account by calling the A-1 Limousine Customer Rewards Team at 1-800-367-0070. There may be a fee (to be determined at the time of reactivation) to reactivate your points. If you have any questions or if you are dissatisfied with the Rewards Program in any way, please contact our A-1 Limousine Customer Rewards Team via email or by calling 1-800-367-0070.